So when the alarm had sounded she had been content to remain in the Youth Center, helping Ernie and his staff looking after the younger children. When Ernie had finally given the all clear and opened the door to the Youth Center, allowing the teenagers that had taken shelter to leave, Ashley had stayed to help with the clear up before heading home. Her parents and sisters were out of town for the night and she was staying with her elderly aunt. It was not late when she finally left and she had decided to find her own way home instead of accepting a lift from her Emily. As she walked through the streets of Angel Grove, she was attacked. Divatox’s underlings had appeared and surrounded her. She had struggled to keep them away in the hope that help would arrive. Having lived in Angel Grove where most people had unfortunately been attacked by something at some point, she had taken self-defence classes. Unfortunately Piranhatrons did not attack in the same way as most foot-soldiers; they swarmed their prey, making it difficult to move let alone land a punch. And once they had taken her off her feet, Ashley felt something touch her neck. After which she knew only darkness. With her parents delayed on their trip and her aunt unaware that she had not arrived home – for her aunt’s home was large enough that Ashley was able to stay in a guest wing without bothering her elderly relative – it would be a few days before her disappearance was noticed. The next morning Porto was finally ready to test his first Dark Turbo Ranger. Earlier he had tasked Rygog with ensuring that Ashley’s family were delayed. Ashley Hammond had proven a suitable wielder of the powers and had unknowingly received training from several of the older Power Rangers when she had joined up to their classes. The only thing he needed to do was secure her complete obedience. Later he would reread the notes and discover that he had meant to say extremely painful. Ashley tried to pull away, a difficult feat considering that the Piranhatrons had secured her in place and tightened the restraints to prevent any opportunity to escape. He placed the larva inside her left ear and watched as it glowed and disappeared, binding with new host. With a contented sigh he returned the tweezers to his workstation and went back to tuning the first of his completed Turbo Keys. By the time the larva was done he hoped to have the device ready. He pushed a series of buttons and a single note started to play. He adjusted the settings until he was satisfied that it was the correct pitch, before adding a second note. He repeated the process until he had five perfectly tuned sounds. Then he adjusted the timing of the individual sounds so that they merged into a single note. He manipulated the pitch and the volume until it reached the level he desired. While not pleasant to listen to, he knew it was right. “I never thought that music would be the key to unlocking the secrets of Lerigot’s work,” Porto admitted. The Power of Turbo was a hybrid of magical energy and technology drawn from the other dimensional source known as the Speed Force. Like most forms of energy it used to generate light and sound. Doing so allowed Porto to adjust the Turbo Morphers; once the internal receivers were correctly aligned the note generated would maintain a constant tone. All that he needed to do was align the parts correctly, and once he had the correct note he could be confident the device would then be able to channel the volatile energy. Each Turbo Key was normally tuned to a unique frequency and wavelength to prevent interference between their powers – for despite the expertise Lerigot had in such matters, it was Zordon, Alpha, Billy, Adam and Trini who were responsible for keeping them working. Porto had designed the Dark Turbo Keys to function using multiple frequencies, which he hoped would make it more versatile and unlock additional benefits later. He strapped the Turbo Morpher to Ashley’s left wrist, noting that as he did so that her eyes had glazed over and she was no longer resisting. That was to be expected as the modified larva secreted an enzyme that subdued its new host’s mind. Normally the host would then spend its time feeding, nurturing the growing larva until it was fully grown and the host died. This larva had been altered so that it would obey instructions from Divatox and her crew. As long as it remained in place the Dark Turbo Ranger would remain under their control. Of course eventually the creature would mature and they would need to extract it or they would lose their Ranger. If she completed her task by that time there would be no need to worry about such things and nature could take its course. He shrugged as he injected her with the priming formula and placed the modulator on her chest. If everything worked as planned the mix of injected chemicals and advanced technology would ensure she survived her first transformation. She did as she was told and a purple glow surrounded her body as the Turbo Key and Morpher were linked. He assumed that the glow confirmed that she was fully connected to her new powers; he didn’t want a repeat of the previous attempt. Satisfied that everything was ready, Porto contacted the bridge and made his report. There was no need to tell the human how to use her new powers; the Turbo Morpher was programmed to upload the needed information to her brain the moment she morphed for the first time. It wasn’t quite the same method Zordon’s Rangers used, but it was close. She responded as he had hoped, looping her arms in a more aggressive version of the Turbo Rangers’ pose, allowing the Power of Turbo to flow through her Turbo Key into her body where the priming fluid had altered her body chemistry enough that with a small boost from the modulator, she started to transform. Unlike the other Turbo Rangers she didn’t call the name of a Zord as she completed her transformation. The Purple powers still required some work and a Zord would be added later. In all honesty Porto just hadn’t found a name he had been happy with. He expected Divatox to put that right when she found out. The result was as he had hoped, the Dark Purple Turbo Ranger – after some convincing Divatox had agreed to call it Purple Racer – stood before him ready for action. He suit resembled the Yellow Turbo Ranger’s uniform, right down to the shape of the helmet; he had tried to find an original shape, but had failed. He was pleased to find that the colour had changed accordingly to a deep purple. He ran a few tests and confirmed the process had stabilised and the toxic effect of the priming fluid had been negated by her powers. It was time to let Divatox have her say. “Well Porto?” Divatox asked as he led the completed Ranger onto the bridge. “As instructed I present to you the first of your evil Turbo Rangers: Purple Racer,” he stated, hoping that she would accept the name. As she spoke the Turbo Powers were updating the suit’s template, adding the name Sonic Nova to its identity. Fortunately Divatox waved off the reply, no doubt eager to see her new Ranger in action. “Destroy them,” she almost hissed. “Yes my Queen,” he mumbled before shuffling away. The Purple Racer followed behind without saying a word. The Turbo Rangers were in action again, this time against a machine monster. Built to resemble a humanoid rhinoceros, it was incredibly fast and with a toughened metallic skin capable of crushing anything in its path. It long horn was incredible sharp and capable of launching as a projectile. By shifting its body it could move from two legs to four legs increasing its speed. On two legs it had sharp claws on its hands and powerful feet that broke the street’s surface whenever it stomped with its powerful feet. When it had first appeared the machine had entertained itself by charging up and down the wrong side of the highway, knocking cars and trucks off the road. By the time the Turbo Rangers arrived, the machine had just emerged victorious following a collision with an eighteen wheeler. The Cogs that accompanied it had tried to herd the terrified humans into its path. Then the Turbo Rangers had arrived and the Cogs were quickly dispatched to the scrapheap. The monster had retaliated by charging toward them, but despite its speed there were five Rangers and between them they managed to keep it on the move while taking shots from a safe distance. The only problem was that with its thick hide, their attacks did very little to slow it down. “Hey ugly, this way!” Yellow Turbo taunted as she cut across its path, causing it to change direction. “No this way!” Blue Turbo countered, using his Auto Blaster to get its attention. “Over here!” Pink Turbo called as she fired at the ground near to its left foot. “Olay!” Green Turbo cried as he slapped the machine on the rear end. The machine grew more and more agitated as the Turbo Rangers raced around, turning it in one direction and then another. Until finally just when it thought it had them cornered, the moved aside to reveal the business end of the Turbo RAM. And then there was a flash of purple light and the Turbo Rangers were no longer standing in front of there; the Turbo RAM was in pieces and the five Rangers were sparking on the ground. There was another flash of purple and the machine found itself facing something it had not been warned about: a Purple Turbo Ranger. Those words snapped the monster back to reality. It had assumed that because the Purple Ranger had attacked the others it was a comrade. Instead it turned out to be a competitor. Well it was a creation of Prince Gasket, the future ruler of the Machine Empire and was not about to back down from a human, even if it was evil. “Earth is the property of the Royal House of Gadgetry,” it responded before unleashing a stream of electrical energy from its right hand. “Tyre Shield!” Purple Turbo called. Porto had used the Yellow Turbo Ranger’s uniform as the template for his first evil Ranger, but he had copied some of the weapons and abilities of the other Turbo Rangers to give her an advantage. The Tyre Shield was one of those powers he had tried to incorporate into her design. Since he didn’t have the plans to make a true copy he had designed his own version in the form of a circular shield that extended from her left forearm. The energy blast was deflected with ease as the shield rotated. The shield retracted into her armour – for unlike the other Turbo Rangers who could choose whether their suits were made from thick solid plates or more flexible fabric, Porto had set her uniform for maximum density at all times. As it did so she raised her right hand and extended two fingers to make the shape of a gun. Her uniform adapted so that in place of a hand she now had Porto’s interpretation of the Turbo Rangers’ side arms. Against the monster’s armoured hide her shots had little more affect than those the other Rangers had taken before. But she had plenty more tricks to show off; Porto wanted her to prove her worth to Divatox. With the flick of the wrist the Auto Blaster vanished and arm blade extended from the forearm. With a sudden burst of speed she attacked, catching the monster off guard and forcing it to retreat. The monster responded with its claws, deflecting the blows but was unable to strike at the Purple Ranger as she dodged around, her armour crackling with energy. Her blade glowed with Purple energy as she slashed the machine at close range and successfully breached its armour. The machine retaliated with a fierce punch that knocked her away. As she somersaulted to bring herself to a controlled stop, the monster launched its horn rocket in her direction. She dodged easily and was soon on the attack again. She dove forward, arms extended with her hands touching. As she flew toward her damaged opponent, the blade extended forward and she started to spin. Her entire body glowed with purple energy as she skewered her way through the monster. She adopted a victorious pose as it exploded behind her. In a flash of purple light a short rod appeared in the Ranger’s hand. She ran forward and leapt into the centre of the five Rangers before extending the cane to deliver an energised swipe across their chests. The Five Rangers tumbled back, surprised by her attack. She used the cane to strike each of the Rangers individually, targeting her attacks to where she knew they would hurt the most. She pulled the end of the cane to reveal a long thin blade that expanded once released. She used the blade to swipe at the Rangers, causing them to spark. When she was satisfied she replaced the sword in its sheaf and twisted the top of the cane to form a handle. The end of the can glowed as it started to fire bolts of purple energy in the direction of the Turbo Rangers. Caught up close there was little they could do to block her blasts as the Purple Racer continued to show off her new powers. As the last shot was fired the cane reverted to its original form. The cane started to spin at an incredible rate, charging with energy as it did so until the ends were glowing purple. As it spun the cane seemed to treble in length forming a glowing staff. Then with a grunt of effort, the Ranger thrust the weapon forward, directing it toward Yellow Turbo. “Tash!” Fred warned as the Yellow Turbo Ranger took the brunt of the blow to her left side as was flung aside. “And then there were four,” Purple Turbo announced. “Who are you?” Pink Turbo demanded. “I don’t know who you are, but you really don’t want to do this,” Red Turbo told her, the Turbo Power Sword raised and ready to strike. She laughed. She was certain that despite his readiness he did not want to attack her. It was too bad really that she had no reservations about striking him or his friends. Once she might have objected, but that was before Divatox had made her see otherwise. “So short of a finisher, no pulling punches,” Pink Turbo agreed. There was always reluctance when Power Rangers faced Rangers that had been placed under evil control. Most forgot in the midst of their concern for a friend or innocent that the powers they wielded would protect them from all but the strongest attacks. And while the Turbo Rangers were just as keen as any other team to try to break through with words and gestures of friendship, they were also happy to punch a little common sense into their bewitched enemy. And then the fight was on, four Turbo Rangers against a single evil Ranger. 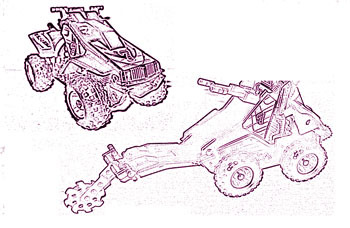 It was no surprise for the Rangers to discover that the Purple Racer was just as fast and strong as they were. With no inhibitions about fighting dirty, she enjoyed a small advantage over her foes – for the Turbo Rangers themselves were not renowned for holding themselves to the same strict code of honour as the older teams. As the tip of the Nova Staff connected, Pink Turbo was propelled through the air, her suit sparking from the concussive force of the discharge. A strike to Green Turbo’s knee slowed him down enough that the next blow would have taken his head off if not for the timely intervention of Blue Turbo. As Blue Turbo helped his friend, Purple Racer turned her attention to Yellow Turbo, who was back on her feet albeit a little shaky. This time though Tasha was armed. Sparks flew as the Nova Staff clashed with Yellow Turbo’s Star Chargers, which Yellow Turbo had elected to use in their more compact knuckle-duster mode. Energised purple connected with energised yellow as both warriors moved at incredible speed. They were evenly matched until Purple Racer drove the tip of her staff into the sidewalk, releasing a shockwave that blew Yellow Turbo off her feet and slowed the incoming Red Turbo enough for her to deliver a clean shot to his midsection. As the street started to crumble from the energy she had unleashed, Purple Racer took the opportunity to observe the carnage. The lapse was enough for Blue Turbo to use his Turbo Hand Blasters to knock the staff from her hand, causing it to revert to its smaller cane form and vanish. Purple Racer cocked her head to one side. It was hard to tell but she almost seemed amused. She vanished in a shower of Purple sparks. “Um Fred, we have bigger problems,” Green Turbo pointed out. Red Turbo followed his team mate’s line of sight and saw that somehow Gasket had managed to make his monster grow without the help of Klank and Orbus. Purple Racer would have to wait. They had more pressing concerns. “Porto, what is the point of having an evil Turbo Ranger if you order her to retreat when she has those Power Punks at her mercy?” Divatox demanded. Divatox had to accept his reasoning. Sonic Nova was still new and untested in battle. There was no guarantee that their indoctrination techniques would hold up if she was forced to work with the other Rangers. On the other hand cooperating with Gasket’s forces after order him to leave the planet was also out of the question. The Purple Racer was aggressive and not afraid to strike the enemy where it hurt. Any protests Porto had raised about the possibility of betrayal had been proven wrong for now at least. She still couldn’t fault him for giving Sonic Nova as little reason to turn on them as possible. “Next time ask before ordering my Ranger to withdrawal,” she told him. She turned her attention to the periscope and watched the battle between the Turbo Rangers and Gasket’s machine. As the Turbo Megazord finished the machine monster with a Spinout, she remembered that she would need to get Porto to step up production of Sonic Nova’s Turbo Zord. That along with the other improvements she wanted him to make would mean that the next time her warrior faced off against Zordon’s brats, they would be eliminated. “Just be sure she is ready when I need her,” Divatox instructed. Purple Racer nodded and removed her helmet, revealing the empty face of Ashley Hammond. She didn’t know what had been done to her after that although she knew that something had changed. It wasn’t a spell, for she had been in Angel Grove long enough to recognise the sensations of being placed under a spell even if she couldn’t fight it. This was different, a physical presence sifting through her mind, dredging up all of her negative emotions and burying anything positive. She remembered a face, no faces, each a mask expressing some emotion that twisted her thoughts and leaving her in a state where while she was aware of her actions, she was incapable of stopping herself. And whenever she thought she had found the strength to break free, she felt something clamp down on her mind, clouding her judgement and making her trust the pirate to know what was right. She had hurt the Turbo Rangers and she was appalled at herself for doing so. But those emotions were quashed by the delight she had taken in harming them and an overriding desire to do so again. She knew it was wrong, but she just couldn’t fight it. The larva Porto had placed in her ear was now secreted deep within her skull where it released chemicals that altered her thought processes. As long as it remained, she would never break free. “It’s no good Zordon, I checked the readings and it was definitely a Turbo Ranger,” Alpha reported. The Turbo Rangers had not been in a good state when they had returned. The battle with the Purple Ranger had taken its toll and while their powers had healed most of their wounds, they still needed the help of Power Mountain’s Medical Bay to fully heal. In the meantime there had been some debate about the exact nature of their opponent. “Divatox does not have access to our systems and lacks Lerigot’s abilities to link others to the Power of Turbo,” Zordon replied. The Power Chamber’s computers had analysed the information recorded by the Turbo Ranger’s helmets during the battle. By merging the five sets of data and their own observations, Zordon had been hopeful to learn the identity of their new foe. So far they had only managed to determine that Divatox had stolen her Ranger’s appearance from Tasha. “I don’t care how they did it, she kicked our butts,” Tasha griped. For the five teenagers it didn’t matter whether or not they had been facing a Ranger or something pretending to be a Ranger. It had been five-on-one and they had only just managed to hold their own. Admittedly she had had the element of surprise, but it had been the speed of her attack that had surprised them. It was true that the Power of Turbo was better suited for speed than it was for strength. Using their minds, their teamwork and their speed to their advantage, the Turbo Rangers had managed to overcome foes that were bigger and stronger. The Speed Force was raw energy and not compatible with the anatomies of most races. It normal required complex rituals to refine it into a safer form like the Power of Turbo. There had been a few humans on Earth who Zordon suspected were capable of using the Speed Force in its unconverted form, but a look into their history revealed that their bodies had been altered either by accident or magic to handle withstand the incredibly corrosive power. Porto was known as an inventor and a mechanic, but not for his knowledge of Ranger powers. The amount of technology and magic involved made it very unlikely he had managed to duplicate the process on his own. Zordon started to wonder if he had help and if so, from whom? “Oh no, we’re going to be late for class,” Justin realised. The others rolled their eyes but after a few comments about nerds, the five teenagers vanished in a shower of sparks, leaving Zordon to his thoughts. The next day passed without a monster attack, surprising everybody. They knew it was unlike Divatox to resist the urge to press an advantage. They didn’t know that Porto had used the possibility of having her new Ranger’s Zord completed as a way of convincing her to hold back. He had also appealed to her need to prove herself superior to the other villains by suggesting waiting until one of her competitors made a move before sending in her Ranger to humiliate them. It was the day after that Lord Zedd decided that using the Rangers’ powers against them was a good idea. He created a monster called Copy Otter from an old photocopier that had for some reason been tipped into a river and a nearby otter. There had been a few pepper seeds inside one of the photocopier’s drawers and they had been incorporated into the design. With a full squad of Z-Putties at his disposal, Copy Otter had appeared in the Business District of Angel Grove and started his attack. Fortunately it was a Saturday and most of the commercial businesses were closed. Those unfortunate enough to be in the area found themselves suffering the effects of the fumes from the pepper spray he spayed in their direction while the exploding shellfish he threw made running away hazardous. Of course the Z-Putties were doing what they did best, harassing those unable to fight back and generally causing problems. That soon stopped when two blurs, one green and the other pink knocked the foot-soldiers off their feet. “That’s enough!” Pink Turbo told them as the blurs slowed to reveal the Pink and Green Turbo Rangers. “We’ll handle these goons,” Green Turbo called to the others. He threw a red pepper in the direction of the three Rangers. Yellow Ranger moved swiftly and knocked it back with the flat of her Turbo Blade. “We don’t eat on the job,” she told him. “Really, how about some sea food?” Copy Otter asked. “This is what I call shellshock!” he boasted, flinging the shellfish and then a handful of starfish in their direction. Green Turbo shifted and shot the incoming projectiles out of the air with his Auto Blaster. “You’ll pay for that,” Copy Otter promised. The rod on his arm glowed and his shoulders flashed. There was a bright burst of light and then two balls of light left his shoulders and flew into his waiting hands. The light faded and he was holding a pair of Turbo Hand Blasters which he immediately fired at Blue Turbo, knocking him down. “You okay?” Red Turbo asked. “Turbo Lightning Sword!” Red Turbo called. “Copy!” And Copy Otter was soon holding a Star Charger in one hand and a Turbo Lightning Sword in the other. “That’s cheating!” Red Turbo added, for a moment considering the possibility that a police officer would turn up just to insist on fair play. He dismissed the idea when he realised most of the time it would be the Turbo Rangers forced to play fair. Then he charged, striking Yellow and Red Turbo with copies of their own weapons as a speed that the Rangers normally used to completely out pace their foes. After he had forced the two to separate he ran circles around the Red Turbo Ranger before swinging his Turbo Lightning Sword to hit him hard in the chest. He threw down the sword so that he could grip a Star Charger in each hand; like Yellow Turbo he had selected the knuckle duster form. Then he tore into Yellow Turbo, pummelling with an assortment of jabs and punches. His last blow to the midsection put her down next to Red Turbo. “Guys!” Blue Turbo called as he made his way over to his friends. Copy Otter’s arm scanner glowed again. “That’s enough!” Green Turbo warned as he and Pink Turbo joined their friends. He unleashed a volley of exploding peppers followed by a round of exploding sea food. The three Rangers were caught in the open and blasted through the air. Copy Otter tried to run off at high speed, but Pink Turbo was just as fast and blocked his path. He turned to run in the other direction and Green Turbo was already there with a closed fist ready to strike. Copy Otter was knocked off his feet at the two Rangers summoned their weapons. “Turbo Wind Bow!” Zordon and Alpha had given up trying to get Rosa to call the Turbo Wind Fire by its real name. She had repeatedly told them it was a bow and it didn’t have anything to do with fire. “Turbo Engine Cannon!” Originally Zordon and Alpha had wanted to call this weapon the Thunder Cannon, but after some confusion with the special Thunder Cannon that was secured to Green Turbo’s Zord, the teenagers had started to refer to it as the Engine Cannon. “Fire!” they called together, unleashing a volley of shots that knocked the monster over. He duplicated their weapons and opened fire, catching all five Rangers in the blast. The five teens groaned as they tried to pick themselves up and groaned again when they discovered that the copies of their weapons were good enough to combine together to form the Turbo RAM. This didn’t look good. The loud rev of an engine stopped the monster before he could fire. The Rangers turned in time to see Purple Racer racing in their direction on a quad bike. They narrowly managed to get out of the way and it was clear from the way that she didn’t attempt to slow down or change course that she had no problem crashing into them. Copy Otter didn’t move and was promptly knocked over. Nobody noticed that as she had passed Copy Otter’s Turbo Power Weapons, Purple Racer had tapped them gently, causing them to vanish as they were absorbed by her powers. His ability to create duplicates was tested by the size of the object, but after waiting for a short time he was able to climb aboard his own quad bike. He revved the engine and tore down the street, then turned the bike around ready to charge back toward the Purple Ranger. The pepper bombs he had thrown around earlier had eliminated any parked cars, leaving the whole street to play in. Purple Racer revved her quad in response, confident that she would win. Copy Otter had made a duplicate without knowing all of the original’s abilities. She was certain that he could not have copied her vehicle’s special features. When Porto had built the Sonic Nova he had looked to some of the Dianthe’s other vehicles for inspiration. As a result the simple quad cycle now boasted a number of optional extras. And after successfully managing to connect it to the Purple Racer’s powers, all he needed was the right opportunity to fully activate it. They turned the throttle and sped forward. The wheels folded down and turned into thrusters, allowing the quad to gain height. Purple Racer flew over the monster before landing again. After the two combatants turned their vehicles around they charged again with Copy Otter prepared for her trickery, only for Purple Racer to do something different. A long serrated blade slid from the rear of the vehicle and as she passed her opponent, Purple Racer forced her quad to spin to the right, bringing the sharpened blade into contact with the duplicate’s left tyres. With two flat tyres Copy Otter was left vulnerable as Purple Racer charged in his direction once more. This time a circular saw extended from the front of the machine and she first raised and then lowered it in a way that sliced through Copy Otter’s crippled quad. “Sonic Nova, Attack Mode!” she cried. The front panel of the quad flipped down, extending the reach of her saw. Two powerful sonic cannons rotated upward rest under the handle bars. The rear section to the quad was pulled forward, extending the rear blade, at the same time shifting the position of the back panels so they now surrounded her as a type of armour. Although she was forced to stand due to their not being enough room to sit, Purple Racer was riding a mobile fortress and Copy Otter was in trouble. Purple Racer opened fire before he could scan her armour. While he dodged the cannon blasts he failed to avoid the saw blade, which decimated his scanning attachment. He looked up in pained surprise as the saw blade descended and the cannons opened fire a second time. With Copy Otter gone, Purple Racer turned her attention to the Rangers. On the Moon, Rita and Zedd were furious that an evil Turbo Ranger had messed up their plans. Losing to Rangers was bad enough but losing to another monster was unforgivable. And so they decided to do something about it. “Powers of evil, make my monster grow!” Zedd intoned, aware that he couldn’t use one of his growth bombs since the monster was in no fit state to use it. Dark lightning struck the remains of Copy Otter, restoring the monster in giant form. The Rangers responded in typical fashion by calling in their Zords, leaving Purple Racer to watch as the Megazord formed. It wasn’t a brilliant plan in fact it wasn’t even a good plan. There was so much that could go wrong every instinct told him to abandon the idea. But as he watched the battle and heard Divatox start to rant, he decided it was better to go ahead so at least he could claim he tried. “Rygog, fire a torpedo,” he instructed. “What’s the target?” Rygog asked. There was silence, which Porto assumed was Rygog deciding whether or not to obey and if he would have to accept part of the blame when it backfired. “Fine,” came the eventual response as the ship shifted in response to a torpedo launch. Porto steadied himself and started to push buttons, remotely adjusting both the Purple Racer and her machine. The Megazord had formed and the battle had started. Copy Otter had not regained his scanning device and therefore was unable to fight back at full strength. However his exploding peppers made it increasingly difficult for the Rangers to get close. A barrage of exploding shellfish struck the Megazord in the left leg. “Chest Blaster!” Red Turbo ordered. The Megazord unleashed the full power of the energy emitters fitted to its chest plate, destroying the remaining peppers before Copy Otter could throw them. The Rangers took the opportunity to close the distance and land a solid kick to the monster’s side. “Guys we have incoming!” Pink Turbo warned as the torpedo struck the ground where Purple Racer had been stood watching. “Did she just destroy her own Ranger?” Yellow Turbo asked. She was shocked at the ruthlessness Divatox showed. Even by the pirate’s standards, that was cold hearted. “No, look!” Green Turbo replied. Purple Racer had jumped off of her quad at the time the torpedo landed, but both she and the vehicle were within range. And both were subjected to the effects of the weapon as they grew to giant size. Purple Racer now matched the Megazord in size and her vehicle had expanded to the point where it was large enough for a Megazord to ride it comfortably. Purple Racer climbed onto her new Zord and revved the engine. “Guys, this isn’t good!” Green Turbo warned. And he was right. The front of the Sonic Nova opened, revealing its twin cannons, which swivelled up and down at the fired, striking Copy Otter up and down the length of his body, lifting him off his feet and propelling him backwards. She adjusted the Zord so that it was facing the Megazord and fired again. For some reason the Rangers hadn’t moved out of the way. He fired another barrage of peppers, which were cut to pieces by the Zord’s spinning blade; it appeared that since growing larger the saw was able to move from side to side and change the angle of the blade. For good measure it also tried to slice the Megazord’s arm, but the Rangers shifted their machine enough for it to miss. The cannons swivelled as the saw blade rose to its maximum height. The wheels rotated and the thrusters activated, allowing the large Zord to hover. Then the Zord moved forward rapidly, the cannons blazing as the saw blade swung from side to side on its way down the length of the monster. “Sonic Nova, Spin Out!” Purple Racer called, causing the Zord to spin in a circle as it passed through the monster, its energised rear blade delivering the final blow as Copy Otter exploded. Purple Racer turned her attention to the Megazord. With a grunt she leapt from the saddle of her Zord and landed in front of the Megazord. Without pause she smashed her fists into its torso, causing the Megazord to stumble back. The Megazord responded with a punch of its own that hardly fazed her; the Rangers had been right that the Power of Turbo would prevent all but the strongest attacks from causing lasting damage. She grabbed the Megazord and threw it over her shoulder. The Megazord used its left hand to redirect itself into a flip and rounded on her with a right hook. She rolled with the blow and attempted to sweep the legs, but the Megazord jumped. On the next blow their fists connected, throwing both the Megazord and Purple Racer to the ground. “Fred we need to withdraw,” Green Turbo urged. The others looked uncertain, but trusting their friend knew what he was doing, they agreed, ending the battle with Purple Racer standing victorious. Justin and Fred both nodded in agreement. While Purple Racer had proven a powerful opponent, it was just an oversized Ranger suit against a Megazord’s armour. In they end they had been confident of a win. As much as they wanted to defeat the evil Turbo Ranger, the Rangers knew they had a sworn duty to reduce the damage caused by monster attacks and to protect the lives of innocents. He looked down at the young Rangers, proud of the way that they had handled their recent encounters. He would ask Rocky, Adam and perhaps Tommy to speak with them about their experience dealing with evil Rangers. “Zordon how did they manage to build a Zord so quickly?” Justin asked. It was not easy to build a Zord. It was not just a case of building an armoured body and a few parts. There were delicate connections that needed to be made for it to work properly. After conducting their scans Zordon had come to the conclusion that Porto had spent as much time stabilising the powers as he had creating them. “So now we have an evil Ranger running around with her own Zord,” Tasha stated. The problem was that now it had been connected to Purple Racer’s powers there was a chance Porto would be able to improve it. They had been lucky during their last encounter. They needed stop Purple Racer before somebody got hurt. And while he hoped that they could get through to her, they needed a backup plan. “Alpha and I have been working on a way block the Power of Turbo,” Zordon replied. He didn’t need to add that it would be a last resort. Nobody doubted that Purple Racer was a victim of Divatox’s schemes. With nothing else left to do the Rangers returned to their normal lives while Zordon and Alpha continued to work on the problem. Porto was pleased. Purple Racer had been praised by Divatox, which meant that as she was his creation, he had been praised by Divatox. It seemed that Divatox had chosen to interpret the Rangers’ departure as an act of running away rather than an attempt to stop the fighting. Porto was just relieved that she hadn’t blamed him. The Zord idea had worked and had provided a method to provide Zords for his other Rangers. Of course he would need to complete work on the Purple Turbo Zord first, but once that was done. And then there were the duplicated weapons that Purple Racer had managed to palm during the battle. He chuckled to himself as he held the remains of Copy Otter’s scanning device, which had been severed during the battle. With a little work he had an idea of how to put the remains of Zedd’s monster to use. He looked to the far side of the workshop where the template for his second evil Turbo Ranger was nearing completion. Finding a suitable Ranger had been difficult and he was still not convinced that she would not fail during her first mission. But if she did he would just move on to the next and hope that Divatox would leave him alone. That was the best he could do.